ROLO 2.0: I'm a GS'r ! Before you get a chance to start putting your own word combinations together (which I'm sure would be evil, too! ), let me tell you what a GS'r is: GS refers to either Gelände/Straße (German: off-road/road) or Gelände Sport. In other words, there is a class of motorcycle called GS or dual sport, meant for both on road and off road travel. There are untold miles of fire roads, old mining roads and unimproved dirt roads in the rocky mountains just waiting to be explored. 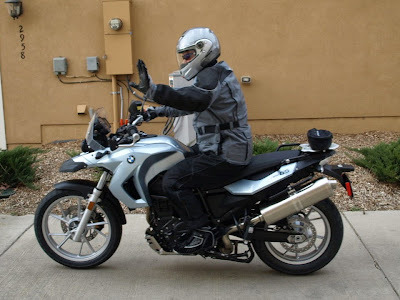 My friend David and I took the motorcycle safety course and got our "M" endorsements on our licenses back in October, with hopes of getting BMW GS bikes. 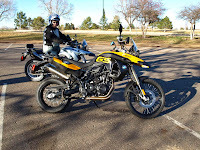 David was looking at the F800GS and I was looking at the F650GS. 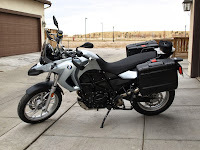 I was originally planning on waiting till spring, but besides being too impatient to wait, BMW announced a price increase on the wildly popular bikes at the first of the year. So, I decided to take the leap into motorcycle ownership! This shot is without the panniers. There is NO storage on the bike, so I have the soft sided "day trip" bag on the back for small items. 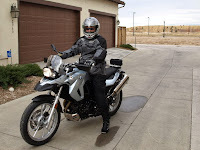 Here I am posing in all my riding gear. Don't worry mom, I'm a huge proponent of all safety gear, all the time! See Ya, I'm going riding! I thought you were going to get a yellow motorcycle?? You got a nice looking bike there, but it ain't no Harley! VROOM< VROOM! Congratulations!! 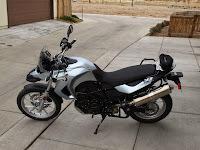 New toys are fun, and that is a beautiful motorcyle! Have fun and be careful! Heated Grips and Fried Turkey!